April 13, 1743 is the birthday of Thomas Jefferson, an American statesman, diplomat, lawyer, architect, principal author of the Declaration of Independence, and the third president of the United States. He grew up and was schooled in Virginia. He entered the College of William & Mary in Williamsburg, VA at the age of 16 and graduated in 2 years. He was 14 when his father Peter died, and he inherited approximately 5,000 acres of land, including the spot where Monticello sits. At the age of 21 he assumed full authority of his land and in 1768, at the age of 25 years, began constructing his residence Monticello, Italian for "little mountain". Two years later he moved into the South Pavilion. His perennial project was turning Monticello into a neoclassical masterpiece in the Palladian style. Based on architectural concepts acquired in Europe, the work continued throughout most of his presidency and was finally finished in 1809. He was a true Renaissance man. He was also a farmer, obsessed with new crops, soil conditions, garden designs and scientific agricultural techniques. His main cash crop was tobacco, but its price was usually low and it was rarely profitable. He tried to achieve self-sufficiency with wheat, vegetables, flax, corn hogs, sheep, poultry, and cattle to supply his family, slaves, and employees, but he lived perpetually beyond his means and was always in debt. Jefferson, a connoisseur of trees, flowers and gardening techniques, created 3 gardens; a flower garden, a fruit orchard, and a vegetable garden. His Naturalistic designs of English gardens featured curvilinear paths, informal planting of flowers, unregimented borders, wild flowers and asymmetrical forms. Twenty oval flower beds were planted at the corners of the house. The beds were each planted with a different flower species with bulbs and seeds provided by a Philadelphia nurseryman. Jefferson loved to garden. He gathered materials from travelers all over the United States and other countries as well. Many of his acquaintances knew of his passion for gardening and often sent him various seeds and plants. He received a yearly shipment of as many as 700 species of seeds from Jardin des Plantes in Paris. He documented his observations of success and failure in his garden book, titled Garden Kalender. He logged the exact dates his seeds were planted, when leaves appeared, and when the flowers blossomed. He loved presenting his work to guests of Monticello and was proud that his gardens were constantly evolving throughout his life. The gardens declined after Jefferson's death in 1826, when his estate was encumbered with debt. HIs daughter, Martha Jefferson Randolph, sold the property in 1831 to James Turner Barclay, a local apothecary. In 1834 it was bought by Uriah P. Levy, a commodore in the United States Navy, who admired Jefferson and spent his own money to preserve the property. His nephew, Jefferson Monroe Levy, took over the property in 1879 and also invested considerable money to restore and preserve it. In 1923, the Thomas Jefferson Memorial Foundation was founded to preserve Monticello, as it was a larger task than one person could afford. The Restoration Committee hired architects to restore the house and grounds, but could not complete the task due to the expenses during the Great Depression. In 1938, the president of the Foundation contacted the Garden Club of Virginia about Monticello and asked the club to help restore the gardens, and they agreed. When preparing to repair the gardens, the Garden Club discovered Jefferson's garden book. In it they found Jefferson's desired plans for restoration. The Garden Club worked to follow Jefferson's wishes, renovating the gardens according to his design. The Club continues to maintain the grounds. Monticello is a National Historic Landmark and the only private home in the United States to be designated a UNESCO World Heritage site. Jefferson was an avid horticulturist and he designed, tended and monitored his gardens. He was a "hands on gardener". 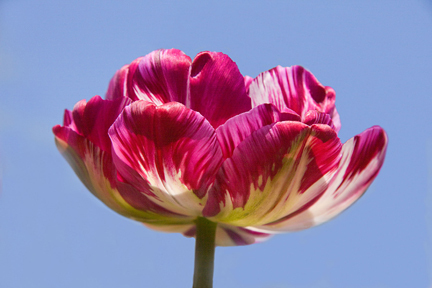 The tulip was probably the most prominent and successful flower in his garden. His grandchildren remembered him planting bulbs with them. Today, some 8000 tulip bulbs are planted in the gardens during October to December, assuring a beautiful spring. 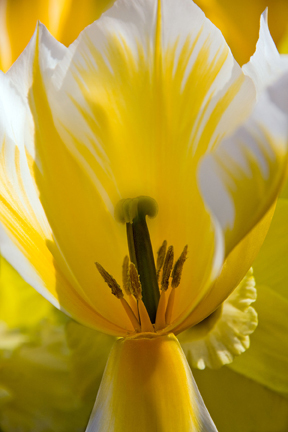 With that in mind we give you some of our tulip images. "Tulip I" was captured in the Keukenhof Gardens in Lisse, Netherlands. 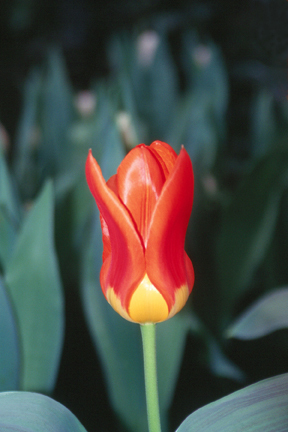 "Double tulip" was seen in the Longwood Gardens in Kennett Square, Pennsylvania. "Yellow Beauty" was found in the Longwood Gardens in Kennett Square, Pennsylvania. "April weather, rain and sunshine both together".